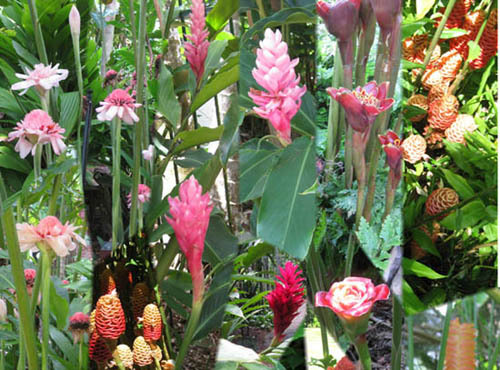 Designer Scarves Explore the Beauty of Tropical Ginger Flowers. 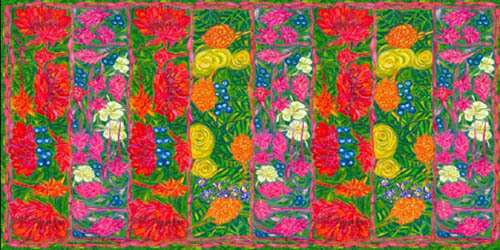 Luxurious Silk Designer Scarves Explore Colourful Tropical Ginger Flowers. 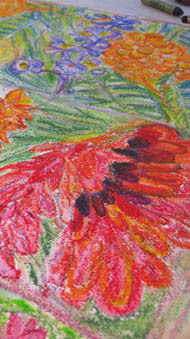 These designer scarves grew from my love of the gorgeous flowering gingers that abound in the tropics. Even the spice types of ginger plants have attractive flowers, although they are generally not as showy as the non-edible types. Are you familiar with them? Mind you, developing the scarves was rather a slow process and it took me quite a while to study and draw, then design this small range of beautifully soft silk satin georgette or crepe de chine designer scarves. 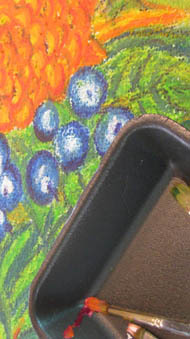 I had been thinking about doing so for ages as it seemed a good idea to have set designs that you could enjoy - and, hopefully, order with the click of your mouse! 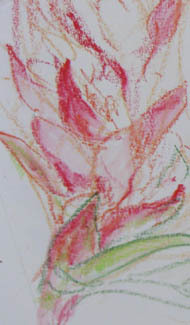 I enjoy the flowering gingers growing in my garden, in resort gardens and parks. Their bright colours, distinctive shapes and long-lasting qualities make for spectacular displays, whether one is growing ginger in a garden or using the blooms as part of an indoors floral arrangement. I decided that there was no better place to research flowering gingers than at the Cairns Botanical Gardens, where a riot of gingers plants, sourced from all over the world, mostly flower at the same time, in the lead-up to the Wet season in North Queensland. Have you been there? It's a beautiful place in which to wander - and learn - after which you may like to have a hearty breakfast, leisurely coffee or delicious lunch at one of their restaurants. Several excursions to these expansive and peaceful gardens resulted in sketches and photographs of the stunning torch gingers in pinks and reds, the yellow and orange beehive gingers, pale shell gingers, white perfumed butterfly gingers, even our own native or wild ginger with its remarkable deep blue berries as well as the variety of greens in their leaves. These flowering ginger designer scarves have been digitally printed in Australia, using the highest quality dyes and pure silk georgette or crepe de chine. They have a beautiful lustre and soft, luxurious 'handle'. 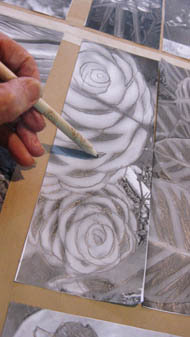 Designs were developed from photographs, paintings and drawings of flowers into a large format, ready for scanning. 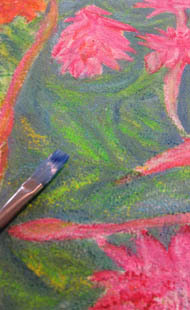 Drawings were made on sized, heavy water colour paper using oil pastels to achieve the textured and sketchy line work, then given a more painterly finish with Archival oil paints. 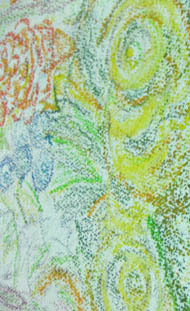 After I had completed the artwork to scale, the scans by Lee Middleton, from High Scan in Cairns, were sent to Think Positive Designs in Sydney, whose chief designer, Penny McIntyre, prepared the files ready for printing. Normally for 'one off' scarves and fabric lengths I work directly onto silk with paintbrush, screens, squeegees and dyes, but this time I wanted to try a more planned and controlled approach. 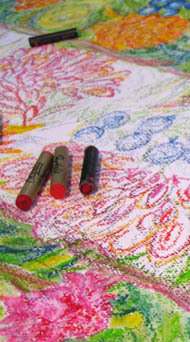 Note that three 'colour ways' have been chosen - the reds contrasting boldly with light and dark green ginger leaves, while the oranges and yellows give a different feeling as does the softer pink ginger design. The wider wrap then combines all three designs in an exuberant expression of joyful abandonment - such fun to wear! These scarves are a generous size, being 45 centimetres wide and 180 centimetres long - a perfect size for dressing up a plain coloured outfit for afternoon or evening wear. By repeating the scarves designs across the silk fabric a luxurious and elegant silk evening wrap or skirt/sarong of the same length (180 cm) but twice the width (90 cm) has resulted. This one, below, really has the 'wow' factor! Wondering how to wear scarves? See what fun these 'fashion models for a day' had as they tried out some ideas in Cairns Botanic Gardens, where inspiration for the designs began. These designer scarves make beautiful gifts - for yourself or for a special person in your life. Silk is really quite tough but as long as you observe normal care instructions it should last 'forever'. Perhaps your beautiful purchase will be an heirloom of the future? 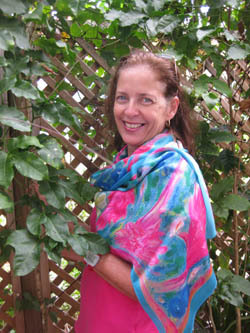 Prices are A$180 for each of the scarves and A$320 for the wider silk georgette or crepe-de-chine wrap - plus postage. 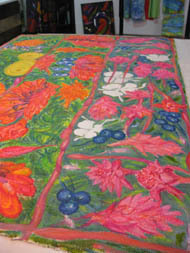 Also see how this passion for tropical flowers developed into more designer silk scarves. On a roll, couldn't stop! If you are a member of this site and receive the e-newsletter 'Perspectives' you automatically qualify for free postage, within Australia, on each of the scarves, above, however many you decide to buy. If you are a site member and live outside Australia I shall subsidise your postage so that it costs you only $A25. Please visit this new website for more choice of designs. 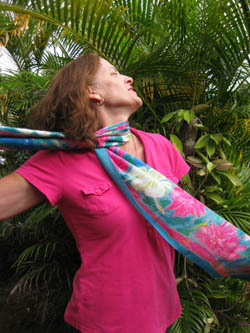 Large pink silk satin georgette scarf - model, Virginia, appears to be enjoying herself! Here are some more ideas on how to tie scarves. Two smaller sizes are available for those who would like a smallish waist or neck scarf or one for your hat. 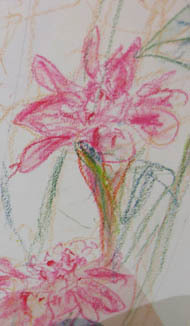 Designs were slowly developed from sketches and flower drawings to paintings and then transposed into digital prints.